Taking DHEA per doctors instructions. Douglas Labs has the best quality. 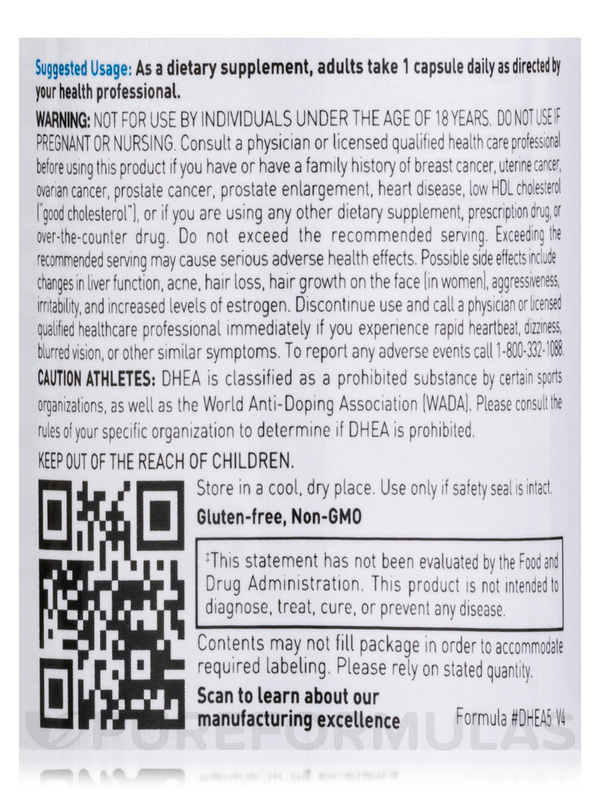 DHEA 50 mg (Micronized) by Douglas Laboratories does exactly what is expected and the price is great! DHEA by Douglas Laboratories was prescribed by my doctor to increased my testosterone in a subtle way. Interested in potentially supporting healthier energy levels? 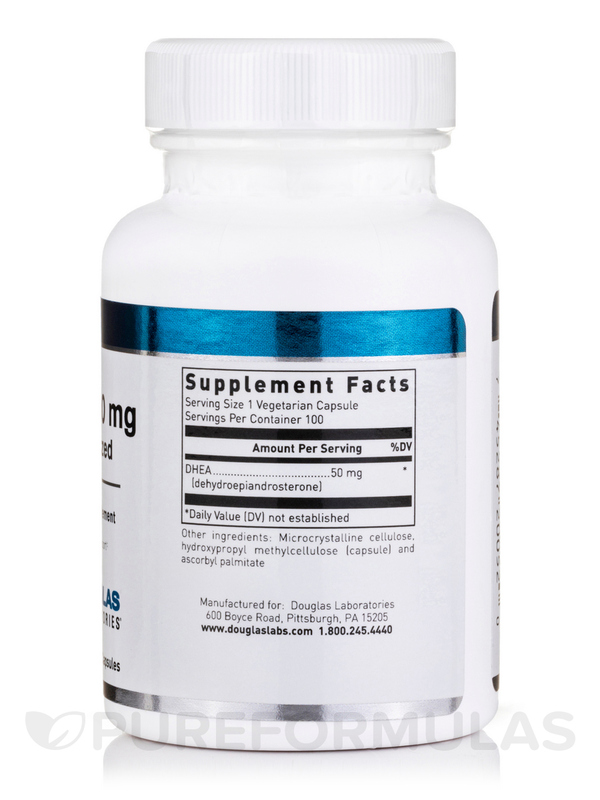 DHEA Capsules from Douglas Labs feature dehydroepiandrosterone‚ a hormone that the body produces. It supports the production of certain crucial hormones while promoting other potential benefits as well. DHEA‚ being a steroid hormone‚ is often utilized by certain individuals to potentially help increase muscle mass‚ strength‚ and energy. 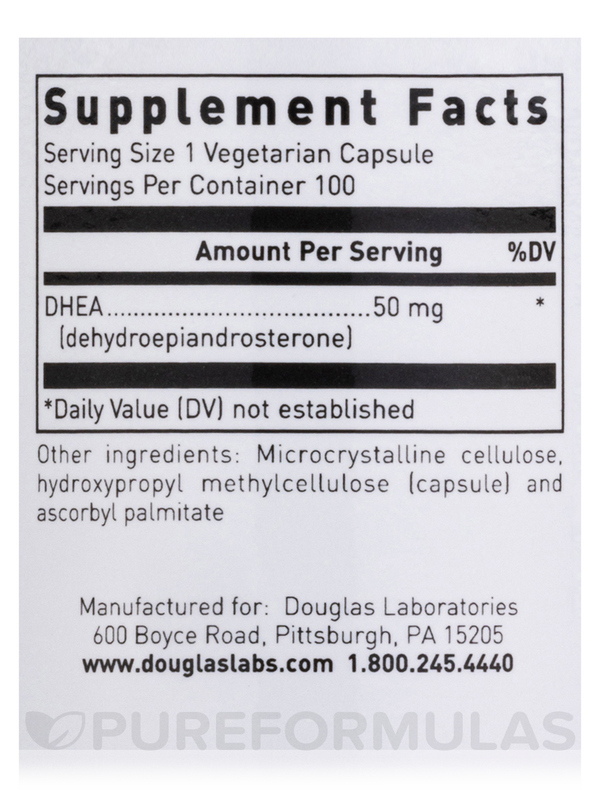 Douglas Labs’ DHEA Vegetarian capsules provide 50 mg of dehydroepiandrosterone in each serving. DHEA may potentially promote healthy energy production‚ immune system support‚ and improvements to overall vitality. If you lead an active lifestyle‚ DHEA may be a great choice to keep energy levels up for strength training and rigorous activity. Additionally‚ DHEA may support the healthy growth and maintenance of nervous system cells. This is because DHEA can potentially improve aspects of cell division. 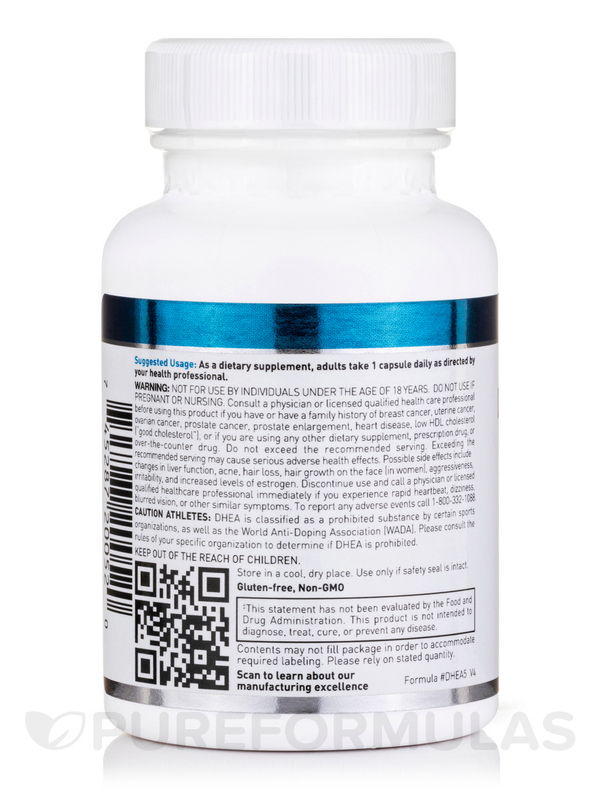 Douglas Labs’ DHEA capsules are completely vegetarian and GMP certified to the highest standards. They can be taken once to twice daily or as recommended by your healthcare practitioner. Order with PureFormulas today! Other Ingredients: Cellulose and ascorbyl palmitate. This product contains no yeast‚ wheat‚ gluten‚ soy‚ milk/dairy‚ corn‚ sodium‚ sugar‚ starch‚ artificial coloring‚ artificial preservatives‚ artificial flavoring‚ or genetically modified ingredients (GMOs). 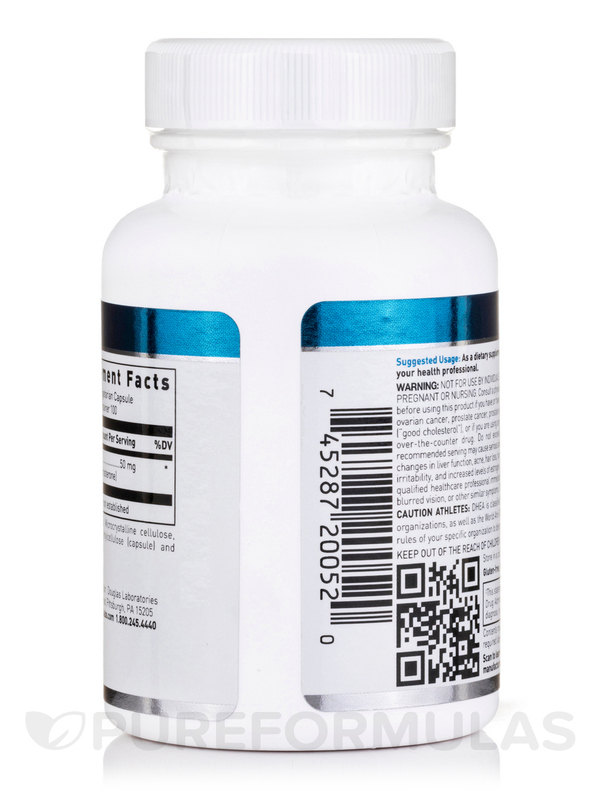 As a dietary supplement‚ adults take 1 to 2 capsules daily‚ or as directed by your healthcare professional. Consult a physician or licensed qualified health care professional before using this product if you have a family history of breast cancer‚ uterine cancer‚ ovarian cancer‚ prostate cancer‚ prostate enlargement‚ heart disease‚ low HDL cholesterol ("good cholesterol")‚ or if you are using any other dietary supplement‚ prescription drug‚ or over-the-counter drug. Do not exceed the recommended serving. Exceeding the recommended serving may cause serious adverse health effects. Possible side effects include changes in liver function‚ acne‚ hair loss‚ hair growth on the face (in women)‚ aggressiveness‚ irritability‚ and increased levels of estrogen. Discontinue use and call a physician or licensed qualified health care professional immediately if you experience rapid heartbeat‚ dizziness‚ blurred vision‚ or other similar symptoms. For optimal storage conditions‚ store in a cool‚ dry place. (59°-77°F/15°-25°C) (35-65% relative humidity). Tamper resistant package‚ do not use if outer seal is missing. 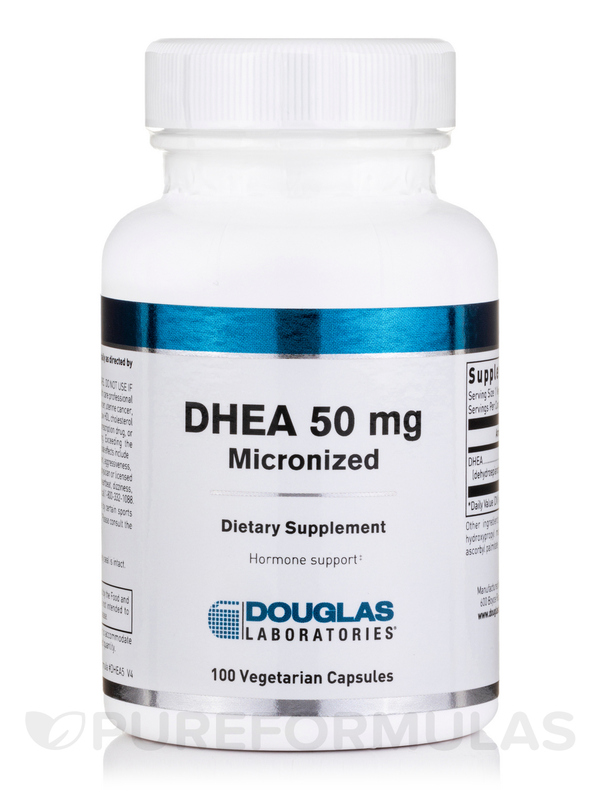 DHEA 50 mg (Micronized) by Douglas Laboratories helped rised my DHEA for my fertility treatment. My doctor prescribed DHEA by Douglas Laboratories to raise my hormones overall. No upset stomach when I take DHEA by Douglas Laboratories. Douglas Laboratories is a great brand! !